Earlier this year, I was asked to be a part of IKEA’s Ambassador program, which was the easiest “yes!” If you’ve been reading for any amount of time, you probably have caught on, we’re long-time IKEA fans. 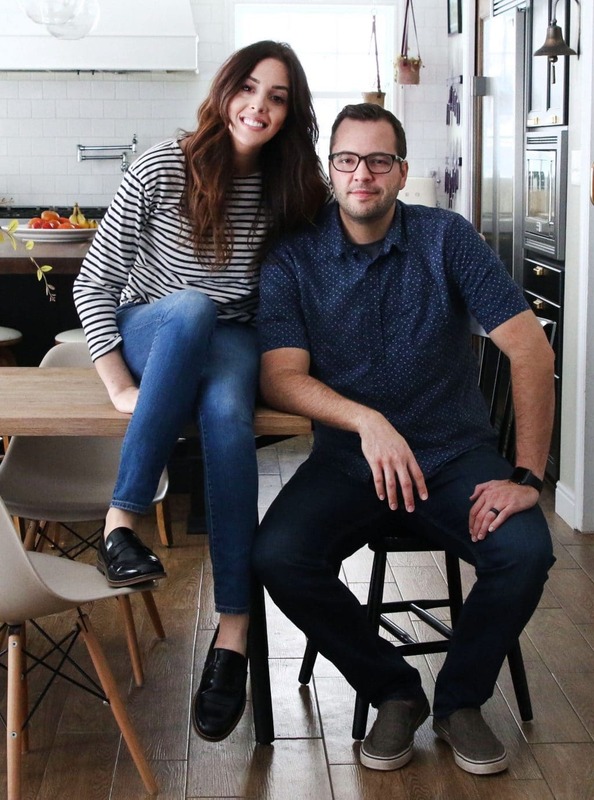 Not only did we use their cabinets for our kitchen (and the Pittsburgh kitchen), there is an IKEA piece or DIY in almost every room in our home, and our last home. I went through some training when I first came into the Ambassadorship and I learned so much about the brand (like, did you know IKEA is an acronym? ), but one thing I loved most was their focus on Democratic Design for the home. IKEA focuses on combining the right mix of form, function, quality, and sustainability at a low price so it can bring good design to the most people. It’s not something that they just check one or two off—they are committed to checking every element off. As they say, “It’s not about making things. It’s about making things better.” Which is our philosophy when it comes to our home and projects, as well. We don’t want to produce content for the sake of content. Chris and I are constantly thinking, how can we improve our home today or this week or this year. 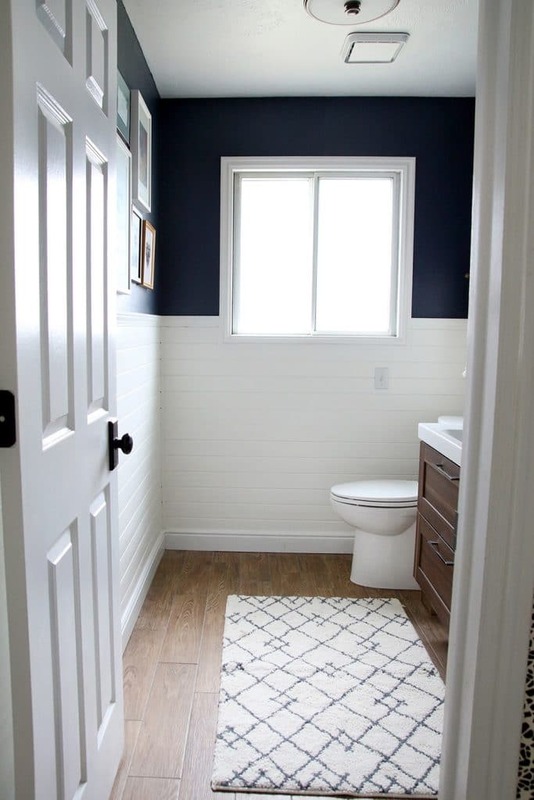 Which is what brought us to this little bathroom refresh. Before our whole family comes for the holidays, our minds kept going back to the half bath on the main floor. 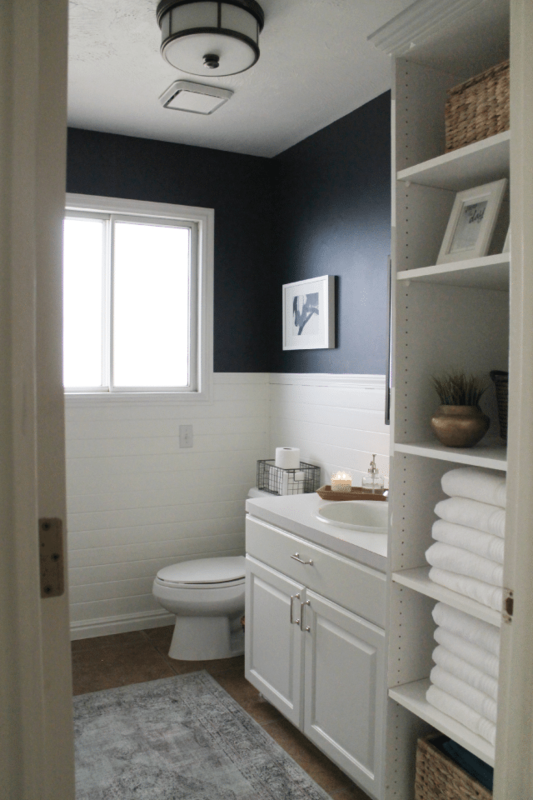 It was the first room we ever updated in this house three years ago, but we never swapped out the faucet, the sink was stained, the linen shelves (that we took the doors off of) felt like they took up a lot of visual space in an already small room. There was definitely room for improvement on every level. We started by removing the vanity and adjacent shelves and the room felt like it doubled in size. We knew we wanted to keep that sense of openness as much as possible, without sacrificing storage. 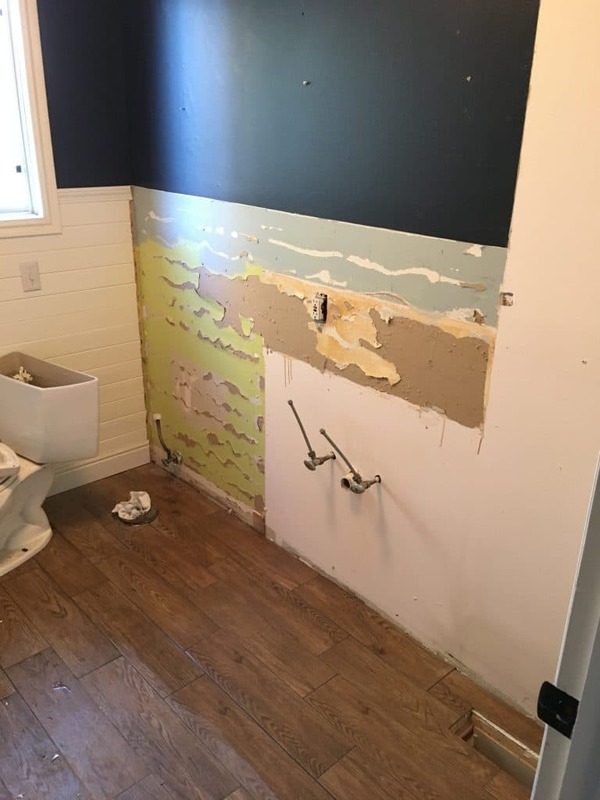 Since we added the wall paneling and wood tile flooring around the previous cabinetry, the first task was patching the walls, flooring and paint. 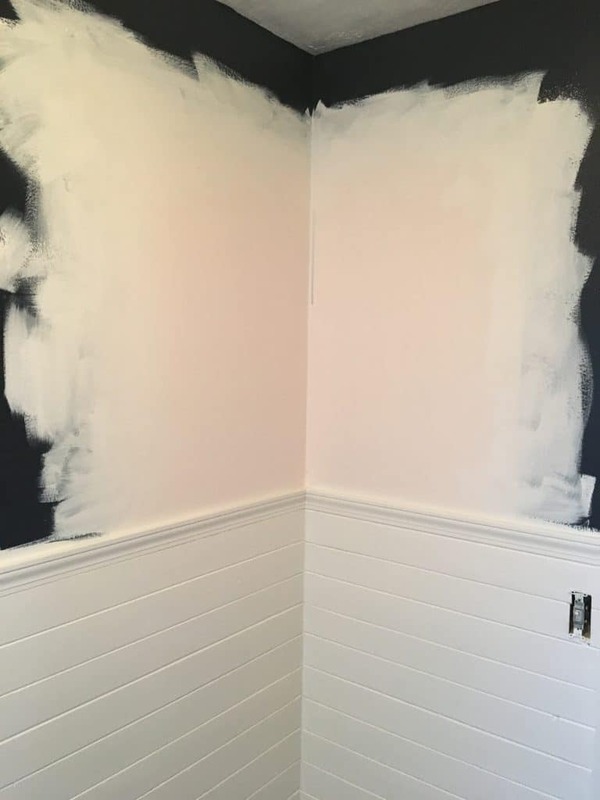 We’ve probably never had a paint color as long as we had the Hale Navy walls in this bathroom (over 3 years!) but it’s an easy color to love, so I rolled it on the parts of the walls that were still sporting colors from all the previous years–even some old-fashioned wallpaper with apples on it behind the cabinetry. When we were shopping for a vanity, I really loved the idea of a sink as the countertop and sink. No crevices for dirt to get into. It’s seamless and waterproof! We purchased this GODMORGON/ODENSVIK combination which featured a floating vanity with drawers in a warm walnut color and added a DALSKAR faucet to the duo. The faucet is designed to help reduce the unnecessary use of hot water by releasing cold when you lift the lever straight up. The vanity drawers came with moveable dividers (what a treat!) and we filled the bottom with spare toilet paper and towels. The linen cabinet from IKEA I’m probably most excited about. It’s the MALSJO glass-door cabinet and it’s a show-stopper. I can see it adding something special to any room in the house and it’s really affordable, too. The glass sides keep it airy, but at the very bottom there’s still concealed storage (not all of our towels are pretty). I’m obsessed with the molding and the little brass knob, the magnetic closure. And somehow, everything that we were storing in the massive shelves we had below fit in here—plus décor. We added this large FLADIS basket on top (also from IKEA) to extend the visual height of the room and I packed it with the extra sheets we were keeping in the guest room. This post is in collaboration with IKEA. We are proud to be a part of their ambassador program this year and can’t wait to share more ways we can all improve our homes. Tearing Out The Bedroom Closets! 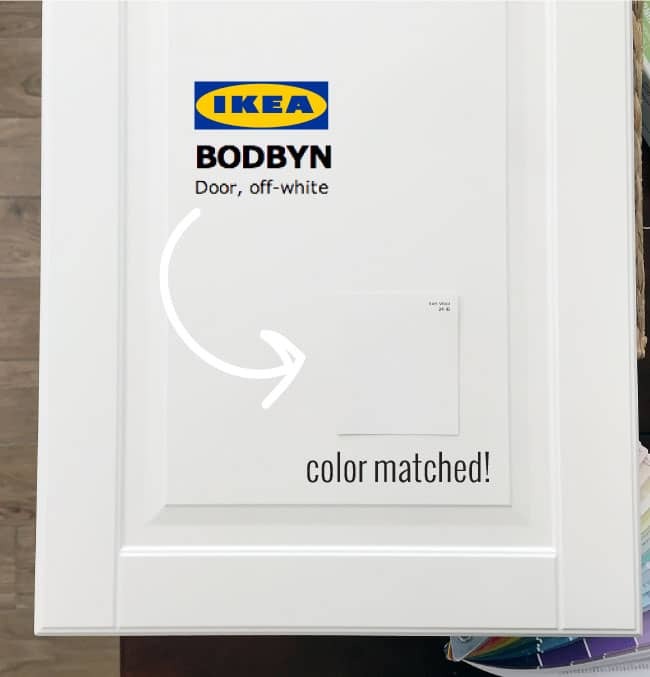 A Paint Color Match to Ikea Bodbyn Off-White Cabinet! Where is your mirror from? I love this transformation!!!! It’s originally from Rejuvenation, I’m not sure they sell it anymore. 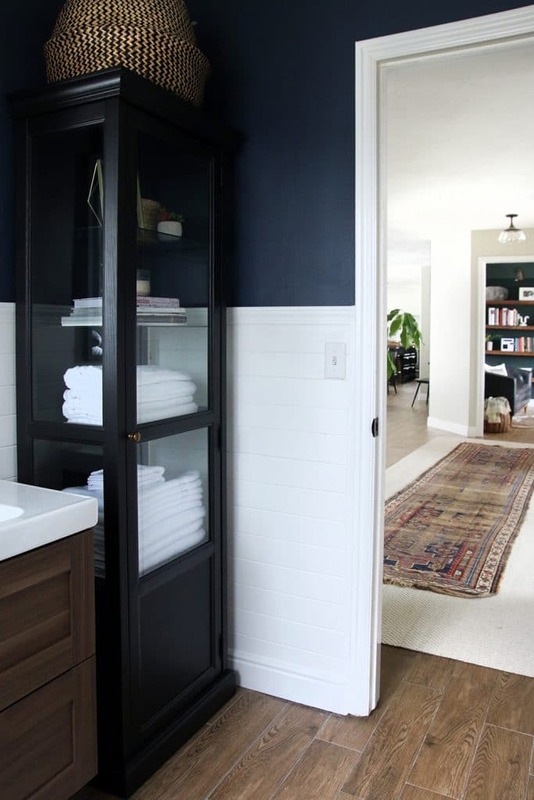 Can you share where the bath mat is from? I’d really appreciate your insight on his above comment based on your experience in using this design in your bathroom! Ikea sells much slimmer plumbing for this exact reason. 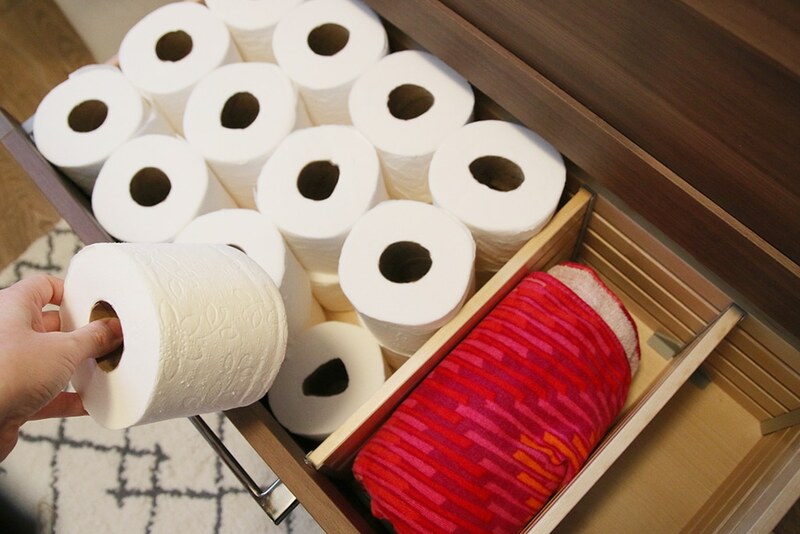 There is some plumbing in the top drawer but it’s also filled with towels and toilet paper. Very usable. Love this bathroom! Wondering about the tile… how hard is it to remove existing tile and install these? I want go do the same in my half bath! Hey guys! Did you do the paneling behind the vanity as well? 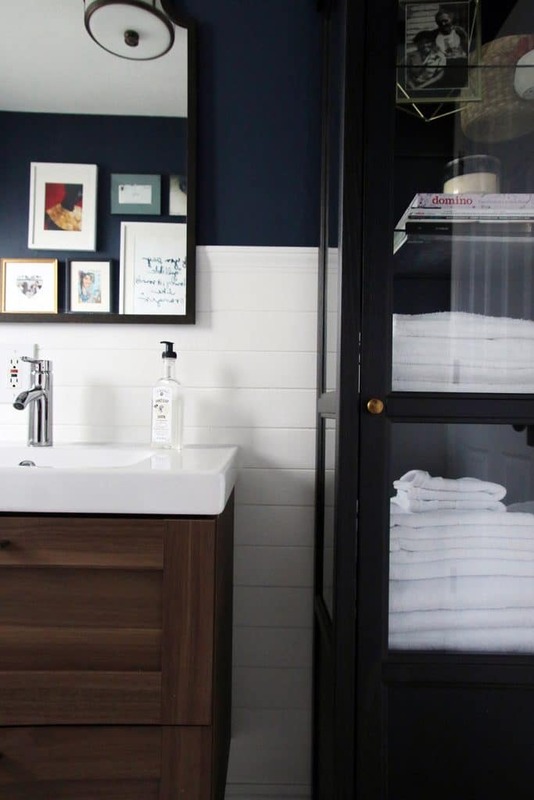 We are about to do something similar in our bathroom (yay!) and we are wondering if we should do paneling behind the vanity and if that has any impact on installing a floating vanity in front of it! Thank you!! :) Also I love your podcast! 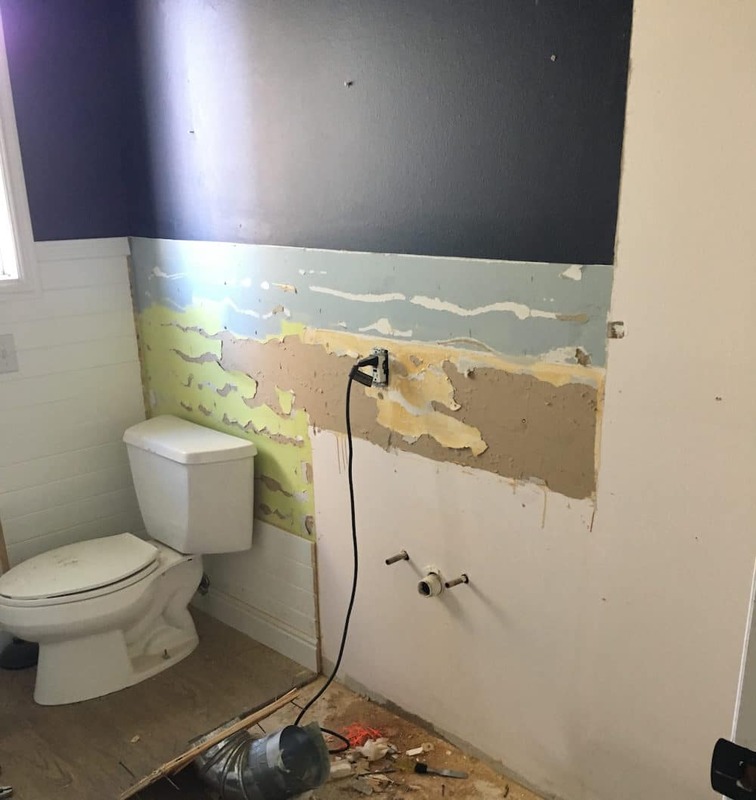 Not initially, but when we swapped out the vanity, it was totally a different size, so it was actually easier to just panel behind it before hanging the new floating vanity. Hi! Which toilet model is this? Thanks! Where are those hand towels from? It is pretty hard to find cute hand towels for some reason. Are you at all concerned about not having a backsplash and water getting behind the vanity or damage to the plank wall? I love the look but am concerned that I might have problems down the road. The sink is siliconed completely around it so water won’t get behind it. And the semi-gloss paint we used should help the wood hold up in wet areas. Just curious, does that cabinet sit right on top of your heat vent? Is that an issue? Thanks! We actually moved and closed the vent in the bathroom. It stays very warm because the heater runs through the floor, and it actually gets TOO HOT if the vent is open. How terrible is it to change out the tile for different tile? We appear to have the same “old” tile in our entry, half bath and kitchen. Love the wood tile look. Did you do this yourself or hire out? We did it ourselves. Although we did it along with the rest of our main floor, doing just this room would only take an Saturday. Hi! Where did the door handle come from? Love it. Does your faux wood tile extend into your entryway? I love the idea of wood tile for the bathroom – but if you have it in the rest of your house do you like it? Thanks! We have it on our whole first floor. It’s amazing! It may have been detailed in an older post, but I’d love to see a closer look about the bathroom artwork! Love this! I’d eventually like to replace my bathroom vanities with the same system, but I’ve seen a couple of people’s reviews that had issues with redoing their plumbing (having to snake it around and flatten it) to make it fit properly with the cabinet. Did you have any issues with the pipes and the vanity? Thanks! The faucet came with pipes that sit very close to the wall, so we installed those and had no issues! Love Hale Navy, esp with the white wall treatment. And, I have those hand towels! Love them! I LOVE the MALSJO collection. My family think I have an obsession. 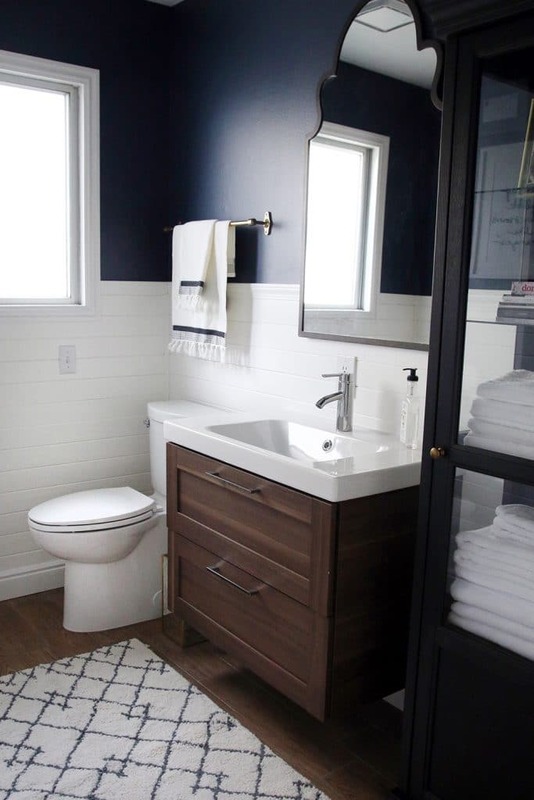 I am always thrilled to see it pop up in design blogs, how the different pieces can be used, and color me surprised – I never thought to use it in a bathroom! LOVE it…this looks great! such pretty colors and textures together. Could you please do a source list of the bathroomincluding links to buy the rug, toilet paper holder, etc. I love everything in this room. The rug is Target, just the smallest size from right here. and the toilet paper holder is $3.99 from Ikea! right here. 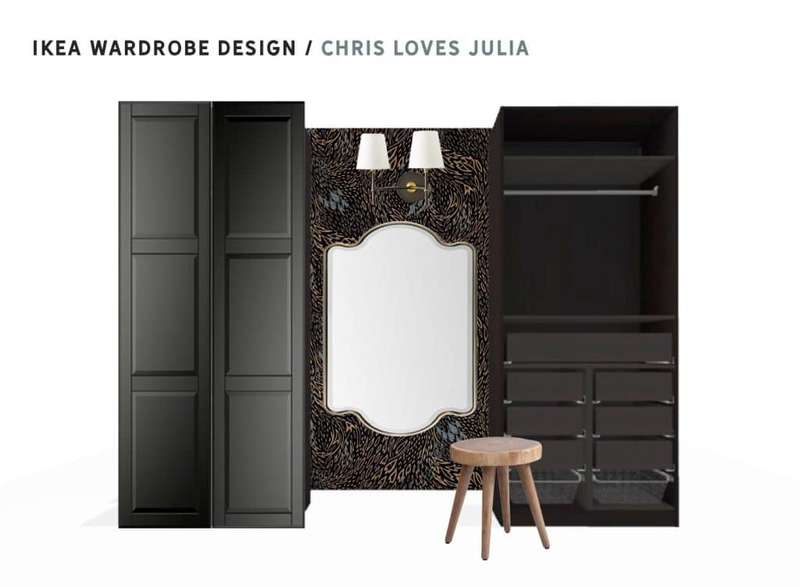 That vanity is stunning…but then you revealed that the drawers have dividers and it became both stunning and brilliant! Love your refresh overall. 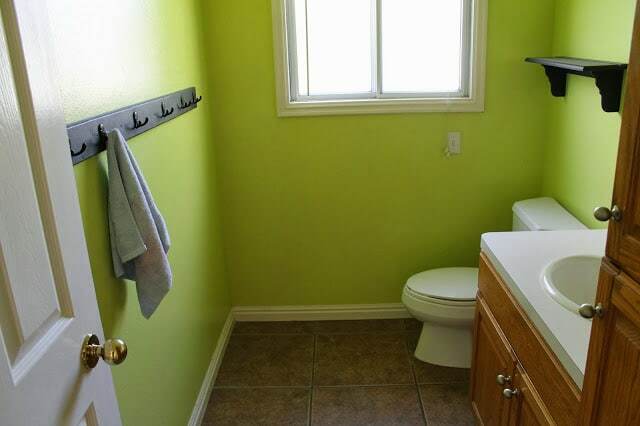 Dumb question but…are you storing towels in there for looks or what? Beautiful! Weird question, but where did you get the paper towel holder and towel rack? Looks awesome! I was curious if you did anything special to protect your wooden walls from moisture. I love it :) So, so pretty. Where did you put the pretty rug that was already in there? How close is your nearest IKEA? Do you go pick it up or order online and have them deliver? It’s 4 hours away! We have family down there so we go pick it up and make a weekend of it. They bother me so much but I don’t think we’ll ever do anything about them. They aren’t popcorn ceilings, just textured and every house in our region has them. I have noticed when we had recessed lighting, it kind of makes them more disguised because light is shining down instead of surrounding it, so that’s the method we’re taking. What a beautiful yet liveable space! Love it. I’m so glad that I found your blog and can creep on all the amazing projects you have. Wow! Love it. Can you provide the source of your flooring? Great update! We recently did our bathroom, and used the same vanity/sink combo from IKEA. We actually spent hours with stain until we came up with a match for some turned legs that we added to the bottom of the vanity to traditionalize the look. But the part we love the most is the drawers. Such a thoughtful design! 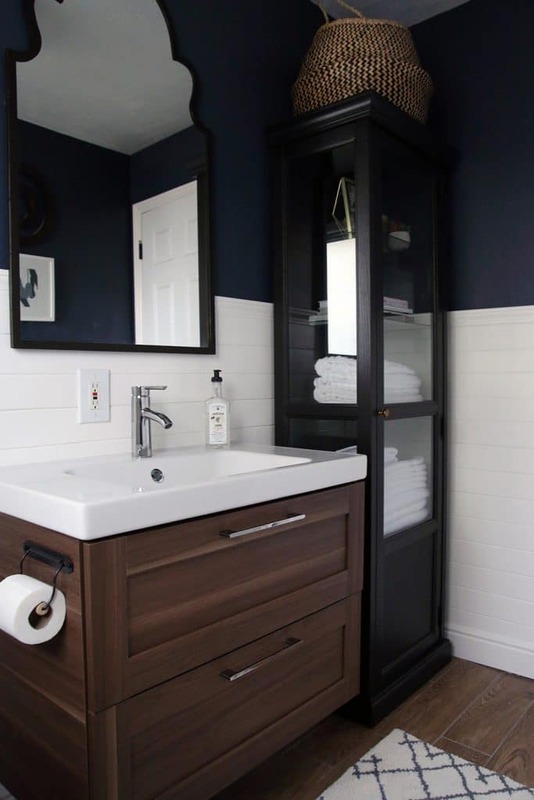 Question: the IKEA vanity is shallower than our old vanity (just like yours), and we’re nervous about installing the toilet paper holder onto the side of it, because it seems so far back to reach. I can twist that way, but I’m 5’1″, so I didn’t want to put it there, and then make it difficult for any tall guests who come to our home. Is your toilet elongated or round? And, how is that location for you and/or Chris? Does it feel like you have to contort yourselves to get at the tp? Thanks! Wow, what a beautiful update + the transformation from the lime green walls to now is AMAZING! Looks terrific! I love the tile and the blue on the walls. Beautiful improvement! QUESTION: we are considering putting the same vanity cabinet in our bathroom but are worried about the wall we’d be installing it on. Did you guys reinforce or build some sort of brace? We live in an old building (I think our walls in the bathroom may even be lath and plaster still!) so I’m kind of stressed about putting in this vanity. 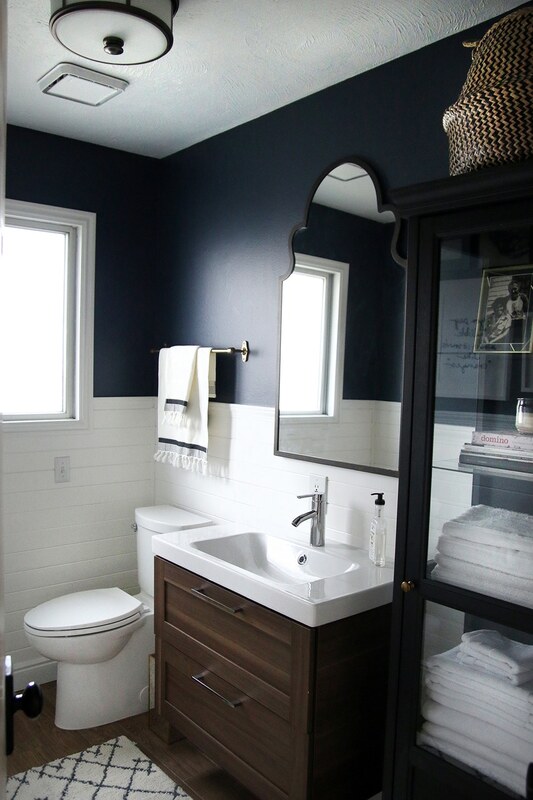 My husband says let’s save ourselves the headache and just go with one with legs, but I LOVE the look of the floating vanity! Would love to hear more details on how you guys installed it. Thanks Julia! We put it into 2 studs and then used toggle bolt anchors in two other places. Great updates! Just love your style! We love IKEA, too! What do you use to clean the fronts of your IKEA kitchen cabinets? We have the black/brown as well, and I find it had to get smudges off sometimes! I use a damp, but rung out so much it’s almost dry, cloth. Ugh, i need you to redesign my girls shared bath. It’s the same size as your powder room just throw in a tub at the one end. 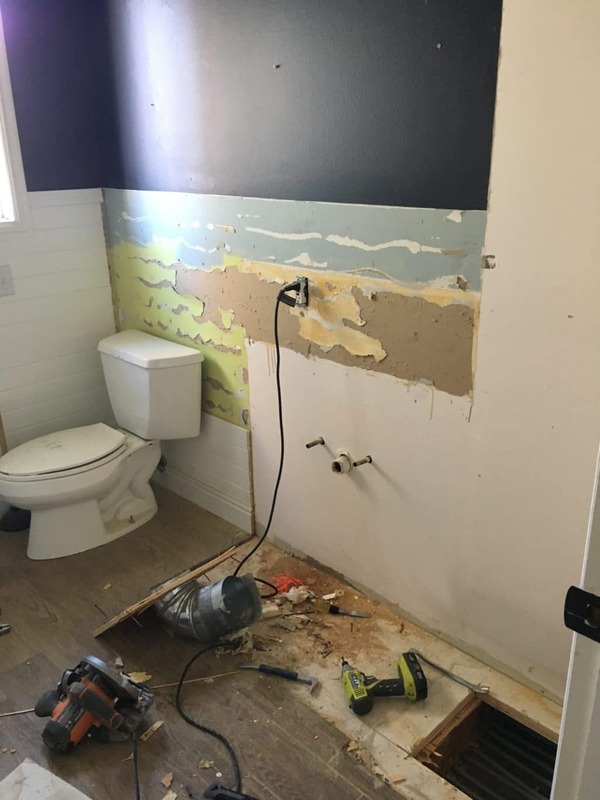 :( It’s supposed to be the bathroom for three bedrooms! Fancy a trip to MD? ? We are planking the bottom half of our bathroom right now. How did you get your mirror to hang with the two different surfaces? I’m having trouble coming up with a solution to get it to hang flat against the wall. Your bathroom looks so beautiful! The chair rail at the top of the molding sticks out about 1/2 inch, which seemed to be just right for the hanging mechanism on the back of the mirror. Hi! 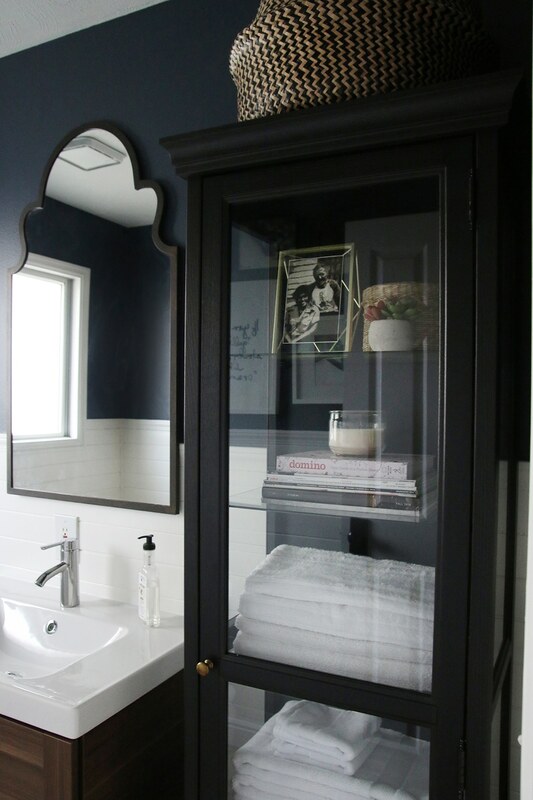 I would try creating a bump out for the top portion by putting a wood bracket on the wall and then hanging the mirror from there. It will make the whole mirror float a bit, but will keep it level with your planking. The mirror we’ve had for a few years. We got it from Rejuvenation originally although I don’t think they carry it anymore. The updated half bathroom looks beautiful! I love the glass cabinet you added, it’s a wonderful storage piece. Is the rug from Ikea as well? The rug is Target, just the smallest size from right here. GORGEOUS! And, as always, the perfect mix of modern and warm! Have you thought about adding a window treatment of some sort for just a little bit of extra softness? yes! I really want to. I’m just waiting for the RIGHT fabric to catch my eye. Incredible! Love everything about this space. What is the paint color? Thx!! Where is the bathroom light fixture from? I’ve been looking for something that style! So good. Everything you do is SO GOOD. I say it every time. Well done! I loooooooooove it, especially the drawers that came with moveable dividers. I’m going to check into that! The rug is super cute. Did I miss the source for that? I picked it up at Target. Cool beans. I’ve seen the larger size there, but didn’t know they had a smaller one. Thanks! Very pretty! It’s a nice update that really fits in with the rest of the house. How stunning ! I would love being a guest at your house and using this bathroom ! I maybe would linger in there a bit longer than necessary ahah ! Hold up!! Where is that super cool toilet paper holder from?